Expert Mathematical Pattern is a multi-currency robot that trades on the M30 period. The expert works on the M30 period. The expert uses patterns in his work. The pattern denotes regular regularity. An expert in history reveals the patterns of the market, in which days and at what time the market repeats its movement in one direction or another. This expert does not require additional optimization. It is automatically optimized during trading by performing the necessary calculations, finds patterns and then uses them. Expert in automatic mode during work tests and identifies changes in the market. After that, using mathematical analysis, reveals the patterns and adjusts to the changing terms of trade. This allows the given expert to work practically without time limits, no matter how the market changes. The expert is created on the basis of studying the deep patterns of the behavior of currencies in the market, depending on the opening of trading sessions, automatically places orders for purchase or sale at the most profitable time, making on average 2 transactions per day or 10 per week. This expert does not require additional optimization. It is automatically optimized during trading, performing the necessary calculations finds patterns and then uses them. No additional settings are required. The program has been successfully tested on the EURUSD tool in the period from 2017.0102 to 2017.11.06 both on history and real trading! 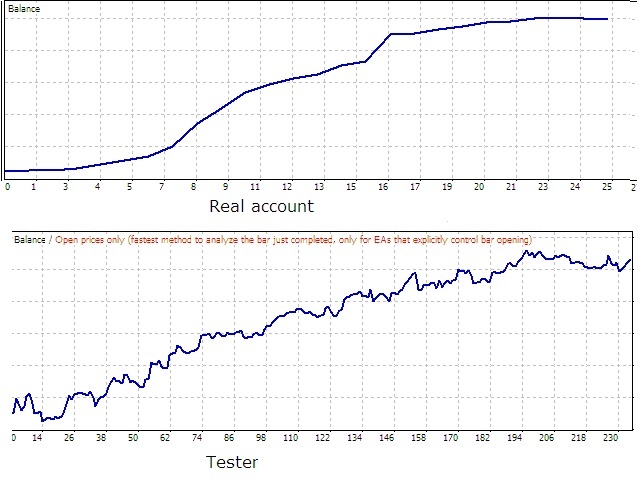 An expert using this tactic took part in the Automated Trading Championship for 3 months, after which he increased the deposit. The expert, who is represented here, is modernized in comparison with the fact that he participated in the Championship. The program identifies patterns using mathematical analysis, and is able to change the tactics of trade depending on the changing market! Makarkin Sergey - participant of automatic trade championships since 2007. I have been developing trading platforms for more than 10 years.